In previous issues of “How Beer Saved Utah” we have focused on the Salt Lake Brewing Company and the Becker Brewing Company in Ogden. For the purpose of this issue we examine the Fisher Brewing Company, which was Utah’s oldest and longest-lasting brewery. Fisher was the only brewery to survive and reopen after prohibition. And to the best of our knowledge, it was the only name in Utah beer from 1937 till its 1957 buyout. The first mention of Fisher Brewing Company by a print publication was August 27th, 1884 in the Salt Lake Tribune. The brewery was constructed using state-of-the-art German methods that Fisher likely learned growing up in the trade. The Eagle foundry was commissioned to construct many of the boilers. Steam powered the boiler engine and the rest of the facility; from malting barley, to milling, to properly drying hops to shipping out finished product on rail-lines and on coaches to hundreds of taverns. It’s clear that every part of the brewing process was conducted on their 10-acre site. The cost of construction was $35,000 another $15,000 would be needed for kegs, casks. The Fisher Brewery in forefront the Fisher Mansion further South. The Fisher Mansion is located at 1206 W 200 S and is now owned by Salt Lake City. The city has plans to renovate the mansion. While the brewery was built on the bank of the Jordan River, the fresh water provided to brew beer came from a nearby spring. Fisher and Moritz were well known in Salt Lake among the pioneers as master brewers. Prior to opening his own brewery Fisher was employed by Fezer and Moritz, then Moritz and Culleo. Moritz and Fisher would go on to start two of the largest breweries west of the Mississippi. Traditionally, the English-style ales had been the most popular beers in the US. But the German-style lagers began gaining popularity due to the longer shelf life and the pasteurization and bottling process which facilitated mass production and distribution. Germans also understood the value of offering a consistent product, carefully measuring ingredients and maintaining quality control standards. Larger at the time then Coors, larger than any brewery in San Francisco, the Salt Lake Brewing Company and Fisher Brewing by 1905 were brewing 100,000 barrels of beer per year. Fisher was brewing 75,000 barrels, distributing throughout Idaho and Wyoming, employing 50 people. By comparison, Uinta Brewing, Utah’s largest, brews 45,000 barrels, employing 35 people. Both had their own water works, malting houses, power plants and very effective distribution operations for offering their beer on draft throughout the Salt Lake Valley, to the dozens of taverns that they owned. By the early 1900s Albert Fisher was an industry titan. Fisher also built one of the finest mansions in the Salt Lake Valley, a block away from his brewery, far away from other mansions. Today it still stands in its odd industrial location. Fisher also built a beautiful two story building on Main Street which had a dual purpose, serving both as a sales office and distribution outlet. The upstairs was a gathering place for the Salt Lake German community and immigrants, who likely enjoyed great parties and gatherings with Fisher beer freely flowing. As a proud German father, Albert Fisher determined that his son Frank showed the most promise to one day take over his brewery and he raised young Frank to learn the business from the ground up. digging that indeed Fisher did not comply with the law which stated breweries or beer or whiskey suppliers could not also operate as retailers. The first calls for prohibition started in Utah far earlier than the rest of the country. The Salt Lake Telegraph reported in 1916 that “Breweries Are Waiting to See New Dry Order.” Four years prior to national prohibition Utah Breweries were forbidden by law from producing alcoholic beverages. By then Frank Fisher was operating the brewery and he said 60 men would be immediately out of employment. Fisher made no plans to manufacture any other product. At this time 130 saloons and taverns were operating in Salt Lake City. This would mean a loss of $195,000 in annual tax revenue. Not to mention the loss of thousands of dollars of rent property owners were receiving and all the supporting farmers in which the breweries purchased their barley and hops. It must have been incredibly sad to see everything he worked his entire life to build end boarded up and abandoned, to lay off all his dedicated employees, brewers and shut down. Albert Fisher would die just one year after his brewery closed. Salt Lake Brewing Company would close its doors for good, never to reopen. It would be sixteen years before Frank Fisher would again file articles of incorporation for the Fisher Brewing Company. 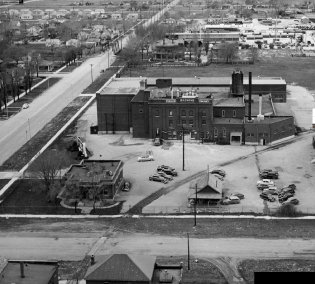 In 1934 Fisher spent $250,000 renovating and modernizing his father’s brewery to make it his own. Upon completion it would produce 275 barrels of beer daily and eventually a capacity of 50,000 barrels. Frank Fisher, like his father, would continually upgrade his brewery and improve his beer. An advertisement from 1941 shows that Fisher was the top selling brand of beer in Utah. By this time competition was growing from San Francisco and Colorado. Lucky Lager out of San Francisco entered the Utah market and its distribution continued to increase due to their low price. Fisher and Lucky were the two top names and dominated fifty five percent market share by 1957. Yet, Fisher’s sales were falling quickly due to Lucky’s low price. In 1957 Fisher calculated that there was no way Fisher could be producing their beer for less than the price they were selling. Fisher learned that Lucky was indeed guilty of price fixing– in their attempt to squash Fisher and put him out of business. A federal court battle ensued, Fisher won this battle and was awarded close to $2 million. Counter suits ensued, but eventually Fisher won the case in Federal court. In 1957, Fisher sold the brewery to his fierce competitor, Lucky Lager. Today, both names are known only to collectors of antique beer memorabilia. The country had changed. Sales to thirsty miners were not enough to compete against nationally marketed brands. The era of Salt Lake brewing greatness would take several decades to rise again to the prominence of these early German brewmeisters.